The British Embassy in Hanoi and the Ministry of Finance agreed to continue their cooperation in developing capital markets in Vietnam. Mr. Giles Lever, British Ambassador and Mr. Ngo Van Tuan, Director General of Banking and Financial Institutions Department, Ministry of Finance at the signing ceremony. Under a new project funded by the UK Government’s Prosperity Fund, the two parties will seek to enhance the development of capital markets in Vietnam through bond market development and expansion of the investor base. In addition, the project will fund expert analysis of the Public Private Partnership (PPP) financing framework in order to develop the ground rules for government support in financing PPP projects. Within the project framework, the Ministry of Finance will organise a number of workshops and seminars to collect comments from relevant agencies and, with technical assistance provided by local and international experts, will formulate new draft regulations on the Vietnamese bond market. A study visit to the UK will also be organised to exchange information, knowledge and expertise about bond market operation and development. 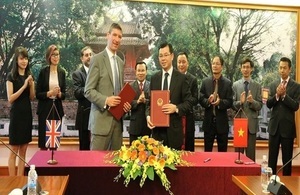 In recent years, the British government has supported Ministry of Finance in developing the financial market through exchanges of experience under the Memorandum of Understanding with the Ministry of Finance and through technical assistance projects in Vietnam. I am very pleased to continue our support for the development of Vietnamese capital markets this year. A well-functioning capital market is an important component of a healthy economy, as it supplements the role of the banking system in mobilizing resources for economic development. As one of the world’s main financial centres, the UK has long standing experience and expertise in this area. I look forward to a successful project which will support Vietnam in its aim of bringing capital market frameworks into line with international standards and attracting greater foreign investment. The support from the British Embassy has supported the Ministry of Finance in policy framework development and capacity building. Through the support from the British Embassy, Banking and Financial Institution department has studied and advised the Ministry of Finance on developing new products on government bond market to improve fund mobilization capacity for the State Budget. The British Embassy also supports the Ministry of Finance in capacity building to successfully deliver the assigned tasks. I hope the wonderful bilateral cooperation within the last few years would lay a concrete foundation for further successful cooperation. This project forms part of the UK Government’s new £1.3 billion Prosperity Fund announced in November 2015. The Fund will promote the economic reform and development needed for growth in partner countries. The 2015 UK Strategic Defence and Security Review announced a £1.3bn Prosperity Fund over the next 5 years to promote the economic reform and development needed for growth in partner countries. The priorities will include improving the business climate, competitiveness and operation of markets, energy and financial sector reform, and increasing the ability of partner countries to tackle corruption. As well as contributing to a reduction in poverty in recipient countries, these reforms are expected to create opportunities for international business including UK companies. The UK Government has allocated around £1.1 million to fund projects in Vietnam through the Prosperity Fund in financial year 2016-17. These will focus on (i) promoting energy security and lower carbon energy and (ii) fostering an open and transparent business environment.